While 2017 is coming to an end, 2018 might even be a more promising year. Accompanied by some new artists, we have a lot of new projects we can’t wait to show to the world. Luckily for us, Eurosonic Noorderslag takes place in January, so we can start right away. With this being said, we are very proud to announce we will host a Dox showcase at Eurosonic Noorderslag on the 20th of January from 15:00 until 18:00 (Dutch time). 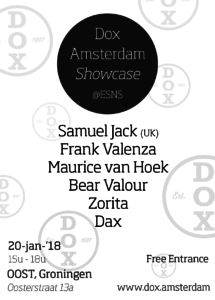 This showcase will be featuring the following (new) Dox artists.